If you can't beat racism, eat it. That's what thousands of people on social media are doing, inspired by footballer Dani Alves eating the banana hurled at him on the pitch. Tens of thousands of people around the world are going "bananas" over a tweet by Brazilian footballer Neymar. On Sunday, the Brazil international and Barcelona forward posted an image of himself on Instagram with a cheeky smile and a banana, side by side with his toddler son. Under the picture was the hashtag #weareallmonkeys, in English, as well as in Portuguese, Spanish and Catalan. Neymar's picture was inspired by fellow Barca player and Brazil international, Dani Alves - who had a banana thrown at him on the pitch in a match against Villareal. Alves kept his cool, picked up the banana, peeled it and ate it, prior to taking the kick. 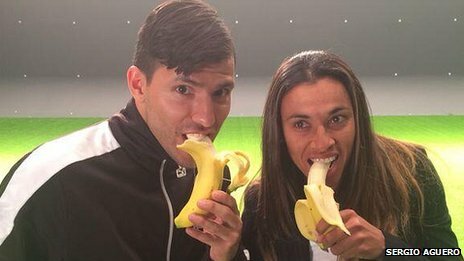 Neymar's tweet seemed like a deliberate attempt to turn eating a banana into an anti-racism meme - he has over 10 million followers on Twitter and 4.6 million on Instagram. Inspired by Neymar, over 100,000 people have used the hashtags - with celebrities and ordinary people alike striking humorous poses with banana in hand. The majority have come from Brazil, where celebrities such as singers Gaby Amarantos and Michel Teló have expressed their support. But the trend is global - for example Cesar Barros, a Boston DJ, posted a selfie in which he displays a large smile while holding a peeled banana. "What Dani Alves did was so amazing," he told BBC Trending. "He didn't stoop to that racist idiot's level and instead he made a joke out of the situation . The racist plan backfired in a major way and now the idiot created a worldwide movement against racism." Monkey noises and throwing bananas are used the world over as a racist gesture at football matches, with mixed race Dani Alves himself previously victimised. By turning the banana from a symbol of racism to a symbol of defiance, will the current trend make a difference? Tom Conn, a Spanish football fan, echoed many others on social media when he tweeted that "in one single action, Dani Alves did more to fight racism than any UEFA/FIFA 'Say No to Racism' has ever done". Please, never forget that white people also live in Brazil.